Book directly with us by email for our Booking Direct best rates. Payment: Payment with Euro cash. We do not have credit card facilities. La Millasserie, a B&B with pool, is located in the center of the Department of the Dordogne, known to all who live here as the Perigord. The Perigord is the land of truffles, wine, grande cuisine, and chateaux and offers music, art, antiques, hiking, canoeing, boat trips on the Dordogne, a variety of sports, and some of the most beautiful landscape in all France. We will be happy to help you plan your tours of the area and make reservations for you, if you require, at any of the excellent restaurants in the region, including nine with Michelin stars. 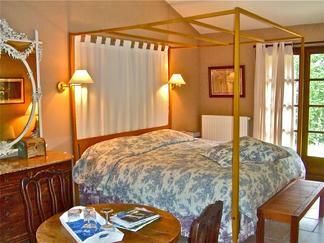 La Millasserie offers four large individual rooms. Each spacious room (16 x 24 feet in size) comfortably accommodates one or two adults. Each room is uniquely decorated and furnished and each has a king-sized bed. All rooms have private ensuite baths, private terraces, private entrances, and easy access to the pool. Wi-fi connection is free. See our rooms on the next page.